Happy new year! I took a few weeks off so I still have a few holiday items to review with you and that includes this palette. 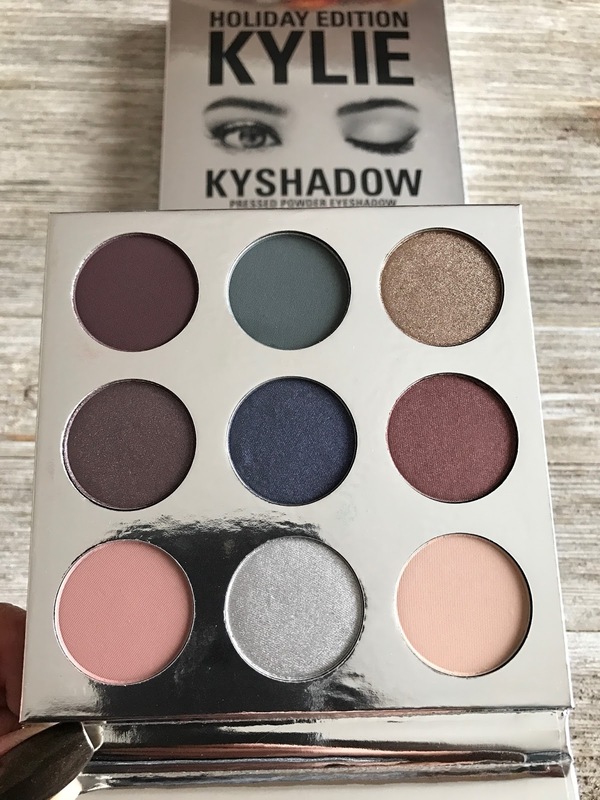 This is the Holiday Edition Kylie Kyshadow Palette which I purchased the very day that it launched. 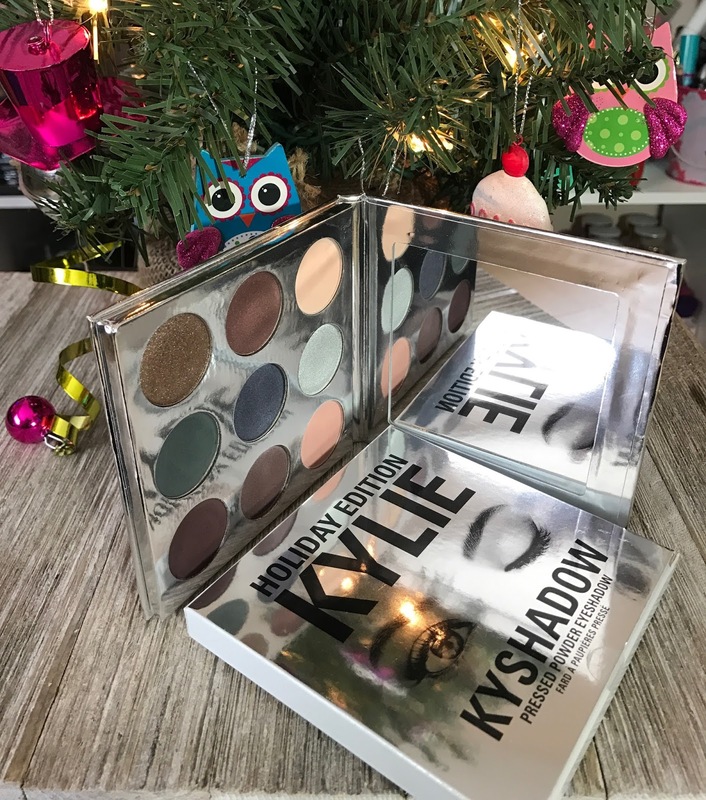 Before I start the review let me preface this by saying that I am not a fan of Kylie nor the Kardashians, but I am huge fan of makeup and especially eyeshadow palettes. I don't own any of Kylie's lip products or her first palette. But when the Burgundy Kyshadow Palette came out, I ordered that immediately because of the shade range, which is stunning. I felt the same when I saw swatches of this palette on the Trendmood IG page. 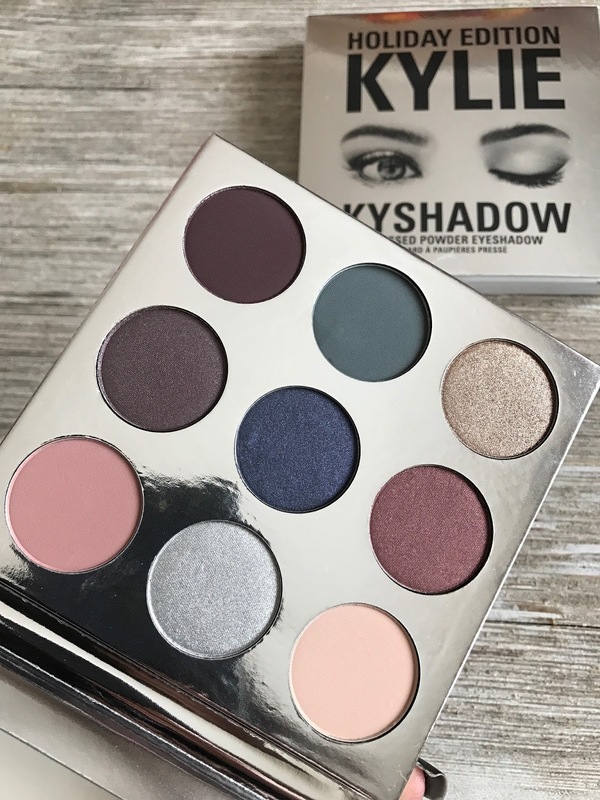 Also, this being a makeup blog, I thought it was time to review something from the Kylie Cosmetics brand, and the eyeshadow palettes seemed a great place to begin. The Kylie Cosmetics Holiday Palette is $42, same price as her other two palettes and features 9 eyeshadows. After much complaining from the earlier palette consumers, this is the first palette that has a mirror. This palette comes in silver packaging for the holiday season, versus the white packaging of the two palettes before it. Upon first opening the palette, I was pretty let down. It immediately did not look at all like the photos that I had seen of it online. In the photos I had seen, the shades just looked so much brighter, they had a lot more shimmer and were just more vibrant. In person the palette seemed to lack all of those things. But at that point I was still pretty excited, especially for that blue shadow. SEE A PROMO PHOTO FOR THIS PALETTE HERE. I love blue eyeshadow! 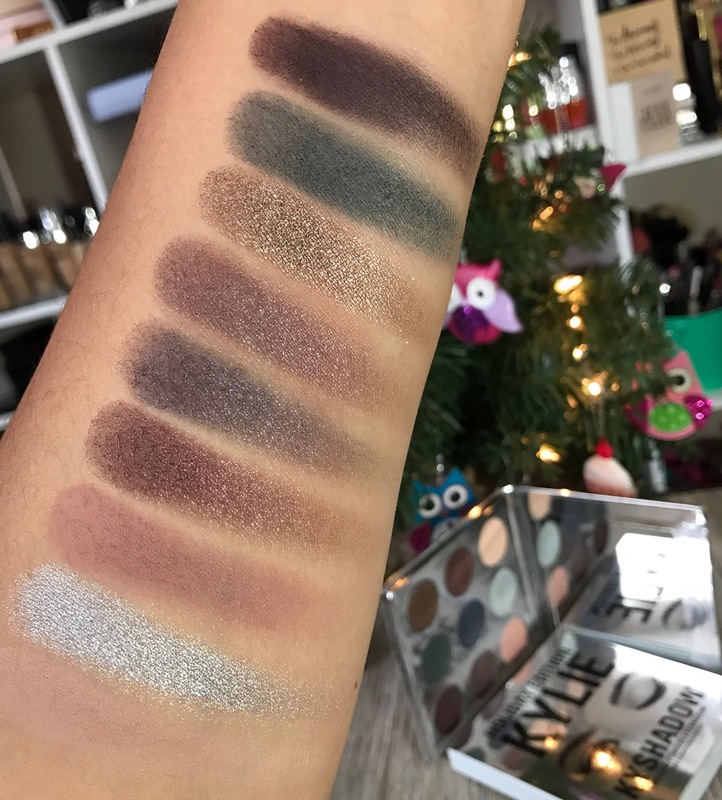 That one shade was really the selling point for me when I first saw the Holiday Kyshadow Palette on the Trendmood Instagram page, plus her swatches were divine. So I was a little disappointed when the entire shimmer row of my palette looked pretty flat, but I thought for sure it would swatch amazing and be nicely pigmented. Afterall, I had already seen those swatches on the Trendmood page and so I thought for sure, it would be great either way. SEE THE TRENDMOOD POST HERE. Unfortunately, the palette is exactly the way that it looks in person, disappointing. Those swatches that I saw on IG were nothing like the ones that I got the day that my palette was delivered. 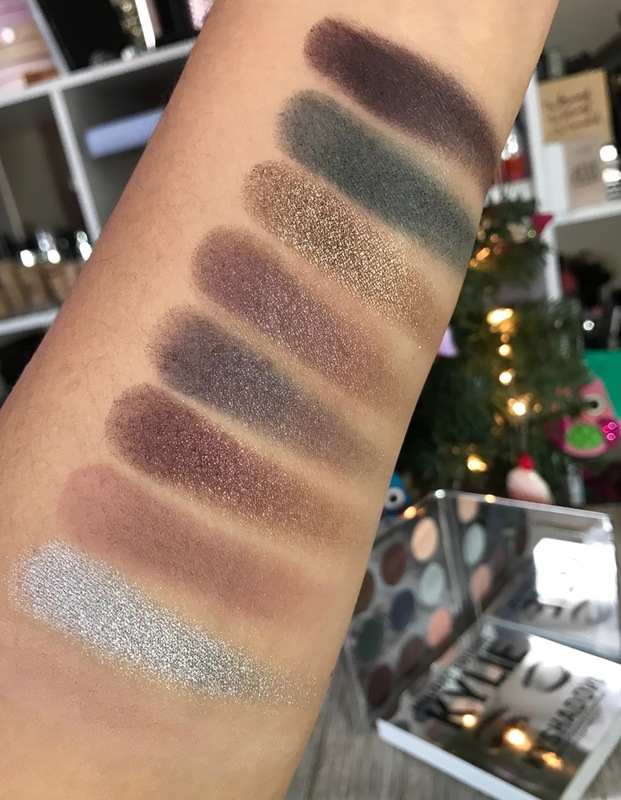 And the saddest thing of all was that the three shades that excited me the most (the middle row), especially the blue, would be the worst in the entire palette. Can you guess which shade in the palette was the worst of all? Yes, the blue. The blue eye shadow has ZERO pigmentation and instead of being a beautiful, vibrant jewel toned blue, it's more of a navy/black. Not at all what I saw on the Trendmood page nor on other promotional photos. You can bet I was pretty upset considering that was the shade I was most excited for. I was so upset that I immediately called a friend and asked her if she wanted to buy the Burgundy palette, which was still sitting brand-new in my room. I even thought that I wouldn't bother to do a review of the palette and just shoved it away for over a week thinking I never wanted to see it again. FYI: Kylie Cosmetics has a no-return policy, so if you buy something of theirs that is crap, you are 100% stuck with it. About a week later I decided that I really needed to review this palette and put it on the blog. I see so many people reviewing this brand and giving nothing but glowing praise and have very rarely seen any negative reviews, so I thought it important that a real review be out there. I turned on my umbrella lighting which I thought would help showcase the shimmery eyeshadows a little bit better and did these swatches for you. That second time around I can tell you that the palette redeemed itself a little bit. The first time I was so upset about the middle row that I didn't really appreciate the other shades. But honestly all of the shades in this palette, with the exception of the middle row, are very nice, and two of them are actually pretty spectacular. Sugar Cookie: this was a bit cut off in the photo but it's actually a very beautiful shade, it is very smooth and very buttery and it has very nice pigmentation, it was definitely a surprise to see how pretty this shade because it doesn't look like much in the pan. Will def be using Sugar Cookie a lot. Frosty: when I first saw this shade I was not super excited because I'm not one to wear a shimmery silver. However, the formula of this eyeshadow is absolutely stunning. In my opinion this is the second best eyeshadow in the palette and the formula is just about perfect. Chestnut: another really solid shade, Chestnut is very soft, very buttery and very nicely pigmented just like Sugar Cookie. This is another every day shade that I can definitely see will be getting a lot of use in the future. Mittens: of the three shades in the middle row this is the only one that is actually decent, it is not as amazing as Frosty or Gingerbread, but it is also not as bad as the next two. Winter: this has got to be one of the worst shadows that I have ever known. It has almost no pigmentation, no matter how many times you swipe into the pan. It's also not a nice shade of blue, and totally not the vibrant blue that we were expecting. Nutcracker: this is another one that is very disappointing, I really can't tell what color it is, I think it's a purple. Whatever color it is, it's just not good at all. Gingerbread: this is my absolute favorite eyeshadow in the entire palette. If the three eyeshadows in the middle row had been the same as this one, the entire pallet would be amazing. I've got no idea why they're so different if they're all supposed to be a shimmery formula. This shade and formula are absolute perfection. If Kylie ever decides to make a palette filled with eyeshadows of this same formula, I will buy it without question. These pictures don't even do it any justice. Evergreen: this was the shade that really disappointed me when I opened it, I was totally un-wowed by it. However once swatching the palette, this was one of the better eyeshadows and super pretty. I love it when an eyeshadow catches you unexpected, when you totally dismiss it and later come to find that it is just wonderful. Silent Night: Silent Night is just a very solid eyeshadow, very much like Evergreen. They are both very soft, very buttery and very pigmented. I have to say that the matte eyeshadows in this palette are definite surprises, usually you don't expect much from mattes versus shimmery eyeshadows. But all of the mattes in this palette are very solid performers. If only we could say the same about the shimmery eyeshadow's. Unfortunately the middle row leaves a lot to be the desired, especially the blue. My overall thoughts on this pallet is that it's not what I expected. 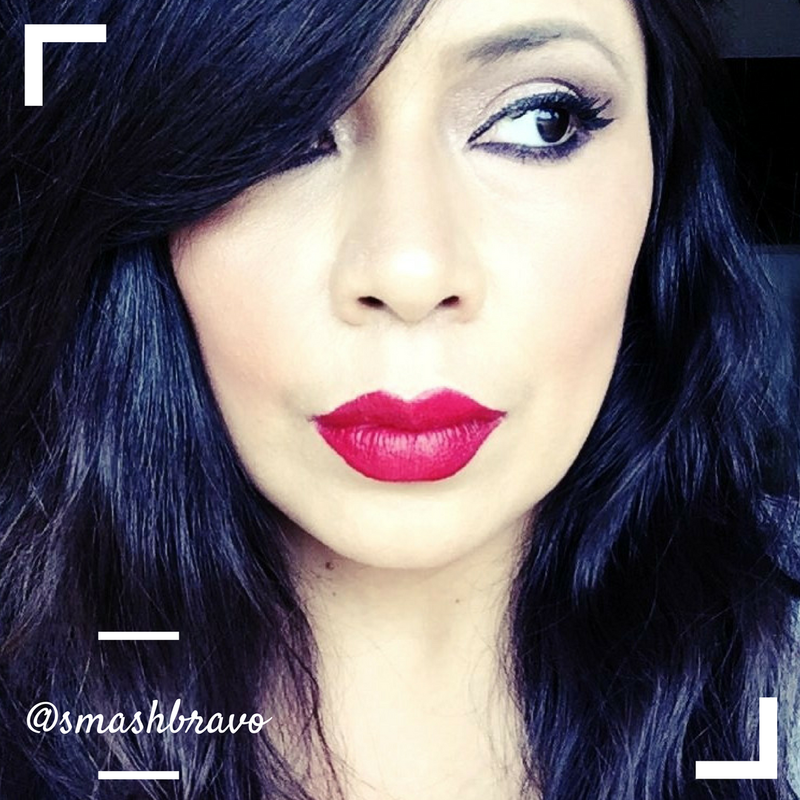 I was really expecting to be wowed by the shimmery eyeshadow's and have average matte eyeshadows. It turned out to be totally different, but at least there are two shimmery eyeshadow's that are perfection. Will I be purchasing another palette from Kylie Cosmetics? Like I said above, I'm not a fan of hers but I am a fan of makeup, so there's no way that I can say no. After all this pallet does have enough good to outweigh the bad. But it definitely is not the perfect, amazing jewel-toned pallet that was promoted. Honestly, there is almost no jewel tone to be found. I would say that only two of the eyeshadows are terrible, which leaves you with seven that are good. That's where you get to decide for yourself if it's worth your $42 plus tax and shipping. Thanks for the review. The swatches look lovely, but I can see how you were let down. I hate when makeup looks different in promo pictures versus in real life.